Twenty years after her father graduated from Millville as one of the state's greatest all-around track and field stars ever, Bryanna Craig is following in his famous footsteps as a multi-event star at Millville. Craig, whose father, Raffael, was a national champion at Millville and is now her head coach, showed that she's more than ready to continue her family's legacy of track and field greatness by turning in one of the most stunning outdoor debuts in New Jersey high school history this past weekend. The rising star nearly broke the national freshman record and recorded the second highest point total in state history (since the inception of the new javelin in 2002) when she finished second in the heptathlon with 4,791 points at the Arcadia Invitational in Arcadia, Calif.
Senior Jessica Swalve (Westmont High in Los Gatos, Calif., finished first with 4,807 points. Craig's 4,791 points is just 143 points off the national high school freshman record of 4,934 set in 2014 by Tyra Gittens of Ensworth High School in Nashville, Tennessee. Gittens, who won the heptathlon at the SEC Championships as freshman at Texas A&M last spring, scored her 4,934 points in an AAU Region 6 qualifier in July of 2014. The 4,791 points by the 15 year-old Craig ranks No. 2 in NJ history (with the new javelin) behind the 4,952 scored by Tia Livingston of Union Catholic at the 2015 AAU Junior Olympics at Norfolk State. After the 2001 season, the javelin was changed for safety purposes to a rubber tip, which causes the implement not to travel as far. Since the two javelins are so different, there must be two different all-time lists in the heptathlon and decathlon. The NJ state record with the old javelin is 4,931 points, set in 2000 by Amber Williams of Roxbury. Here's a breakdown of how Craig racked up her 4,791 points. On Friday, Craig was third in the 100 hurdles (14.88 for 858 points), tied for second in the high jump (5-3 for 736 points), placed second in the 200 (a NJ#1 25.60 for 833 points), and was sixth in the shot put (29-8 1/4 for 467 points). On Saturday, Craig finished first in the long jump (17-0 for 609 points), fifth in the javelin (103-11 3/4 for 509 points), and second in the 800 (2:23.35 for 779 points). 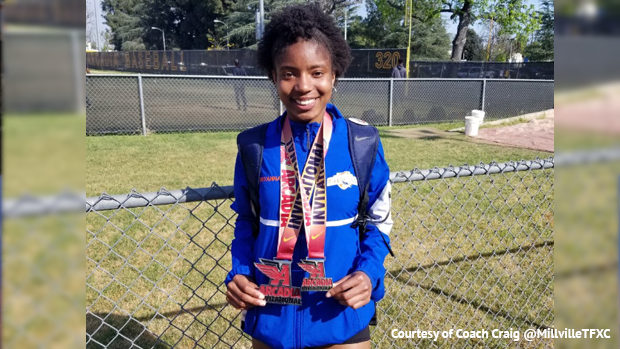 While Craig's performance is truly remarkable considering it came in the first outdoor meet of her high school career, it shouldn't come as a complete shock. Craig, the oldest of five children, has been a youth age group star for several years, and last summer she won the heptathlon in the 14-year-old age group at the AAU Junior Olympics at Drake Stadium in Des Moines, Iowa, and was ninth in the heptathlon at the USATF Junior National Championships at Indiana University. And it sure doesn't hurt to have all that talent in her blood. Just how good was Bryanna's father? As a senior at Millville in 1999, Raffael Craig won the pentathlon at the 1999 National Scholastic Indoor Championships. Then at 1999 Outdoor Meet of Champions, he cleared 7-0 to place second in the high jump, finished fifth in the 110 hurdles in 14.35, and was sixth in the discus (159-0). He went on to star at UConn, where he captured the pentathlon at the 2000 Big East Championships. Now 20 years later, it's Bryanna's turn to carry the track and field torch for the Craig family at Millville. And she appears well on her way to burning up the record books just like her dad did.